Toss from behind serves a couple of goals which makes it a great drill for catchers. Drills that work multiple aspects are great to teach or practice as in a game you will be doing many things at once and you need to be able to perform many tasks. The first goal is to practice the speed a catcher can get out of their squatting position and get onto the ball. Quickness is essential for a catcher as time is everything and that split second you spent taking that extra step that wasn’t need could be all the runner needed to be safe at first. Practicing so your body remembers these movements and getting it conditioned is a great way to be game day ready. The second and third (grouping the pickup and feet position) goal which this drill help is the picking up/scooping ability of the catcher. Since the ball is being thrown from behind the catcher, the ball is simulating a bunt which will be rolling away from the catcher. If the ball is going towards the first base side, the catcher wants to use both hands and have their mitt scoop and bring the ball to their bare hand when they are picking it up. This helps stop the ball from moving and making a mistake trying to only bare hand the moving ball which is rolling away from them. And if it is rolling towards the third base side, you will also perform the scoop if it is still rolling, but your feet will be different. You will want to step and plant your right foot past the ball towards third so you can use it as a pivot to spin your left foot towards first base to throw. I would also like to add that if the ball IS NOT moving but has come to a stand still, you can use only your bare hand to pick it up. But when you do, make sure you drive your hand down on it to the ground to make sure you get a good grip on it. This is a lot for one drill but these aspects are very important. A catcher must be aware of how to play a moving or dead ball and how to position their feet. The block position to throw is a simple exercise drill but a very crucial one. What you want to do is first start in the blocking position (on your knees and glove plugging up the hole between your legs) and then pop up and get into the throwing position as fast as you can. Timing is very important to a catcher on how fast they can get their throw down to the base and having a quick motion and release will greatly improve that timing. And the only way to improve it is to practice. When you start feeling comfortable doing this drill, start adding in a baseball that is placed in front of you and when you start your motion to pop up to get into the throwing position, grab the ball like you just blocked it. Adding in this element will make it more like a game day situation as you will have to pick up the ball to throw it and most likely it will be somewhere in front of you after blocking it. If you feel a little uncomfortable doing this don’t sweat it. After practicing it for a while it will become a more natural feel for you. After that, you can add in the squatting position to the drill. You’ll start in the squatting position, then transition to the blocking position, and grab the ball when you go into the throwing position. As you can see, you can keep building onto this drill once you become settled and comfortable to increase the training. You’ll ultimately end up blocking real pitches, picking the ball up while going into the throwing position, and throwing to your intended target. That is the end result you want as that is what will happen in a real game and what you will want to practice. But remember, one step at a time. If you don’t learn the basics right, you won’t have a great result. If you ever have problems in any part of your motions, just remember the basics! This was a drill that was taught to me at an early age to help me get my feet in the right position to throw out runners at second base. What my coach did was draw an “L” shape in the dirt behind home plate where I would be squatting to receive a pitch. My right foot would be on the end of the L on the bottom and my left would be off the L. When I would get up to throw, I would shift my right foot to the base of the L where the two lines meet, and my left foot would move to the very top of the L making both my feet line up. Even though this was a drill to help my throw downs to second base, this helped me to keep my body straight and inline when throwing to any base. This is a straight forward drill where the catcher will start in the squatting position and have someone standing in front of them point to either the left, middle, or right and the catcher must block as if a pitch was coming from that location. It’s a tedious drill, and I admit that. But it’s a basic drill that is the foundation of catching and a catcher has to know how to block pitches. If a catcher cannot perform this ability, pitchers will lose faith in them which could lead to pitches being kept up in the zone of fear of throwing in the dirt or being replaced with another catcher. The walking blocking position drill was taught to me by a catching coach and really stuck with me. In this drill, the catcher will be following the coach (or another player) and the coach/player will tell them ‘down’ periodically. When they say ‘down’, the catcher has to get into the blocking position and then pop back up as fast as they can and continue walking. This is another drill that will help improve the quickness with the catcher getting into and out of the blocking position. You can also add in blocking to the left and right along with the middle if the catcher is improving on just downing in the middle blocking position. Another quickness drill (you see a rhythm?) that is done with real blocking of pitches. The coach or player will stand half the distance to the mount (between home plate and the mound) and will toss baseballs straight at the catcher in the dirt. At first, only practice down the middle pitches to get used to it if you aren’t great at blocking. When you get better, have the throwing throw to your sides as well. The thrower will not tell you where they are throwing. Not knowing where the pitch is going, and the short distance from where the pitch is coming from, the catcher has to react very quickly and figure out where the pitch is coming from. This will help their recognition of the pitch and angles. After doing this many times, the catchers should be able to see where the pitch is going from where the ball is released and the angle it takes. 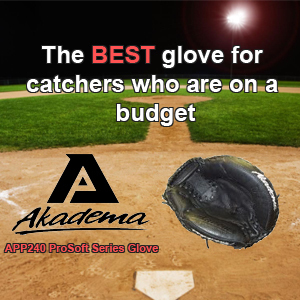 Learning this will be very beneficial to catcher and will greatly improve their skills. In this drill, the catcher is in the squatting position with no glove and catches easy lobs with their receiving hand while framing it when caught. This drill teaches you to have easy hands while receiving as you are not using a glove, quickness in your focus as the tosses can be thrown quickly so you need to catch, frame, and drop the ball for the next ball. Referring back to my Tampa Bay Rays spring training video that I posted in the Blocking section, it also includes this drill towards the end of the video. The clock framing drill is also done barehanded and has someone else throw a ball to the catcher who is in the squatted position. The thrower will toss the ball to four spots, left (9 o’clock position), high (12 o’clock position), right (3 o’clock position), and low (6 o’clock position) and have the catcher catch the ball and frame it. Each spot has a different way of framing as framing an inside pitch is not the same as a low pitch. Doing this quickly and in multiple sets will get the catch to remember the movements of his body and will teach them to instinctively frame a pitch without thinking about it.